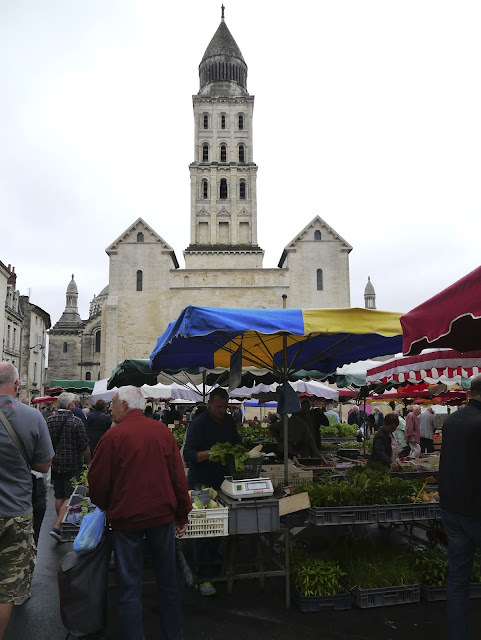 You might not get that the reference in the title of this post is to Stephanie Alexander's great book Cooking and Travelling in South West France. It's a fantastic read with a great balance of recipes and recommendations on travelling, primarily in the Dordogne. I recently spent a week in the area and the book became something of a bible. I referred to it for recommendations on market towns and restaurants even though the book was published back in 2000. If you don't know the area, the Dordogne is picture-postcard France. Rivers wind lazily through the farmland, chateaux perch high on cliffs or nestle secretively in thick forests. It's bucolic stuff. Given the inspiring setting, I thought I would do a series of posts on some of the food I cooked from the many markets I visited and on some of the restaurants I ate in too. First up is cooking. 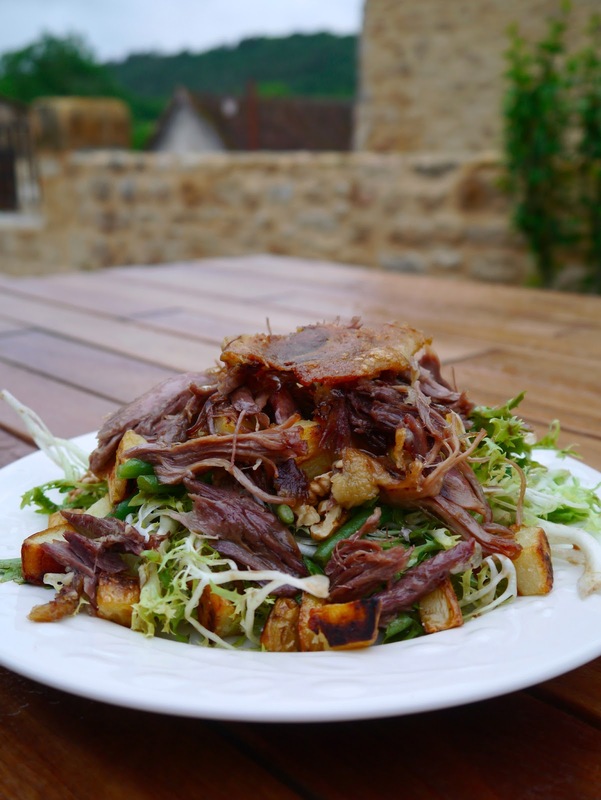 This immense Warm Duck Confit Salad doesn't come from Stephanie Alexander, but is based on one from another great Australian cook and writer, Jill Dupleix. You don't win friends with salad, right? Well, this recipe will prove the Simpson's wrong. The area around Perigueux is ground zero for traditional rich French food - foie gras, confit and truffles are all specialities of the region. Still, walking around the markets, it's impossible not be inspired by all the other food on offer too. In early summer, cherries, melons and wonderfully scented strawberries shared market stalls with these more traditional products. So for this salad, I picked up the duck legs from the market in Perigueux. These were vac-packed, not from a can, but still came with a generous coating of fat. To succeed, the salad needs a bitter contrast to the rich duck meat, so you want some tart salad leaves - frisee is ideal, but you could really use whatever you like. The dressing, too, needs some sharpness. Use a good red wine vinegar to keep it local, or you could even invite some international flavour in with a good balsamic. Start with the duck. Put the oven on to heat to 160 degrees Celsius and warm a frying pan over a medium heat. When the pan comes to temp, put the duck legs in skin side down. The goal here is to render the fat, crisp the skin and get the colour going. Tip off the fat as it starts to melt but save it because soon you're going to fry the potatoes in it. 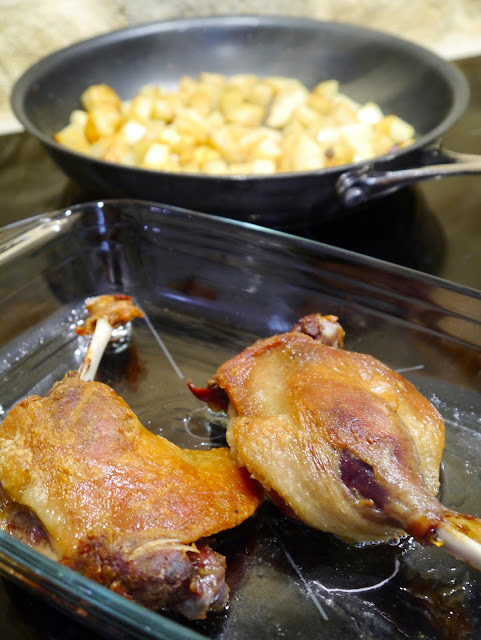 Flip the duck legs a few times until they are looking delicious and tanned and then put them in a roasting pan, cover it with foil and pop it into the oven for 20 minutes. This is a foolproof method for crispy skin and fall-apart meat. When the duck is cooked, take it from the oven, let it cool a bit, and shred the meat with two forks and discard the bones. Keep the skin - obviously it's the best part. Help yourself to a few bites as a chef's treat while you get on with the rest of the prep. While the duck is roasting, wipe the frying pan clean, bring it back to a medium heat and add a few tablespoons of the reserved duck fat. Throw in the chopped potatoes along with the smashed garlic cloves. Toss them around a bit to coat in oil. You don't want the heat too high or the potatoes will burn and not cook, so play with the temperature. Toss them around every now and then to colour on all sides. They should take about 20 minutes but it depends on how big your cubes are. Once done, set them aside to drain on some paper towel and sprinkle with salt. Try not to eat too many before you compose the salad. While the potatoes cook, put your beans in boiling salted water for about 5 minutes, then drain and refresh. You want a nice bite to them, so taste before the cooking time is up. Rinse and dry your salad leaves. Making the dressing is as simple as combining all the ingredients and giving them a bit of a whisk, so hop to it. Now let's dish up. Place your washed and dried salad leaves in a bowl with the beans and pour over your dressing. Mix it well with your hands before adding the duck and the potatoes and give it another toss. Now plate up and sprinkle over some chopped walnuts. Top with a piece of crispy confit duck skin, if you have any left, and then enjoy. This salad recipe is great and very easy to cook. My father is interested in cocking very much and he has wished to make a chef in his life. He runs his restaurant in France from long time. He really likes your recipe and wants to try this soon. This is really good idea that eliminate delay on toll roads by collecting the electronic tolls. According to the public are suffered with this toll problem and seeking help from the government to get rid of this problem.